The Fossil Freeway is a stretch of highway between Nebraska’s Panhandle and The Black Hills of South Dakota where visitors can stop at multiple sites and experience some of the world’s rarest and most remarkable fossils. 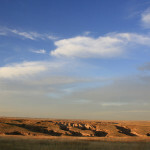 Fossil Freeway sites include: Mammoth Site of Hot Springs, Toadstool Geologic Park, Hudson-Meng Bison Bonebed, the Trailside Museum at Fort Robinson State Park, Agate Fossil Beds National Monument, Scotts Bluff National Monument, and the Wildcat Hills State Recreation Area. The Northwest Nebraska High Country is a great place to stay and experience the outdoors, it’s also home to more than 25 ranchers and farmers who provide unique opportunities for tourists via guest ranch stays, trail rides, fossil hunting, hiking, birdwatching, photography and more. 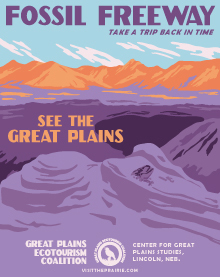 Several members of the High Country group are also members of the Great Plains Ecotourism Coalition. Driving along a dirt road in the high plains of northwestern Nebraska, High Plains Homestead appears like an oasis. The Old West outpost is located in the middle of the Oglala National Grasslands, an expanse of 90,000+ acres of African-like savannah. Owners Mike and Linda Kesselring are veterans of Nebraska tourism and after 16 years of business have seen a lot of repeat visitors—and for good reason. The couple works hard at it, embodying western hospitality and greeting all guests that come through the screen door like long-lost relatives. High Plains Homestead includes a school house, saloon, mercantile, post office, jail, and blacksmith shop. Individual lodging is available. At the center of “town” life is the Drifter’s Cookshack, a restaurant featuring high-quality home-cooked meals. Our Heritage Guest Ranch is nestled in the foothills of the picturesque Pine Ridge. Owner Jean Norman is a fourth generation rancher with fifty years of experience and knowledge working in the Nebraska Panhandle. She organizes special experiences for her guests, including guided fossil digs, natural horsemanship training and multi-day horseback journeys. Her six-day Lakota journey is led by a tribal member who introduces groups to the plants and animals of the area as well as Lakota culture, astrology, traditional cooking and storytelling. Jean has shorter horseback expeditions as well, and also the option to participate in everyday ranch activities: fixing fence, haying, lambing and calving. Jean also makes beautiful art incorporating natural materials — ask her to tell you the story of the fence post, now bedpost, that saved her life in a blizzard! In their hay day, sheepwagons were simple mobile homes for sheepherders living amongst their flocks in the open rangelands of the western United States. 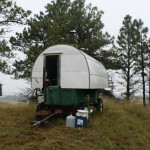 They’ve all but disappeared from use, but thanks to Jim and Lora O’Rourke — rangeland scientists, ranchers and sheepwagon collectors — you can wake up in one of these Old West wagons, tucked into the hills of Ponderosa pine. 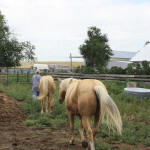 The O’Rourkes run RuJoDen Ranch and are international range management experts. They accept a limited number of visitors, providing nature walks, historical land use discussions and demonstrations of sustainable grazing practices.